For many years, I have taught at both the university and high school levels, either as a side job or as a primary job when my boys were little. I have also at various times tutored individuals of all ages in a variety of subjects. In 1934, in an entirely different context, Huey Long gave his famous “Share our wealth” speech. The wealth that I have chosen and been able to share in my life is that of Knowledge. In fact, I learned about Huey Long’s speech in junior high school from a very nondescript history teacher, but I never forgot the story. 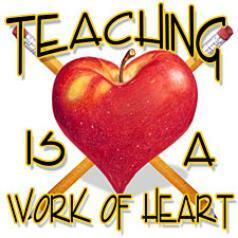 When all is said and done, teachers are very special people. They do a difficult job for not much pay. They shape and form our children. They touch our lives in so many ways. Some are “good” and some are “bad”, but somehow, some way, there are those “special few” who have really touched us during our lifetime and made a difference. At various times, on the last day of school, I have seen children and parents burdened with bouquets of flowers or boxes of chocolates to give to these special teachers. By all means, it’s a lovely gesture! But let me share with you an even more special, substantially less ephemeral, gift that can be given to a teacher, instructor, professor, or tutor… that of a lovely hand-written card. As someone who has taught and taken my job seriously, taking great pleasure in sharing the wealth of knowledge with young people, I can tell you that there is no greater gift than learning from a student how you changed his/her life. I have a special keepsake drawer where I have kept a handful of cards written by students that I have had in the past. In those cards, they have thanked me for a variety of things: “teaching me to think”, “teaching me math when no one else was able to”, “teaching me to be critical of my own work before someone else can be”, “showing me that teachers are people too”, to name a few. These cards have made their way into my treasure trove and these students, of course among others, became particularly memorable to me. One year, prior to the birth of my first son, I had a high-school student who I noticed consistently switched numbers around in his notes or made odd spelling errors. His grades suffered as a result of seemingly “silly mistakes”. He was often told that he didn’t focus enough. He was a nice young man as I recall, and I asked him if he could stay after class for just a moment. At that time, I asked him one-on-one if he had ever by chance been diagnosed with dyslexia. His face took on an odd smirk and he looked suddenly fearful. He asked me why I wanted to know. So I shared with him the observations that I had made in class. He hastily added that no one had ever told him this before, and asked if he could please be excused. I let him go without pushing the point. About a week later, the young man asked if he could speak to me after class. “Of course,” I said with a smile. After class, he approached me gingerly and told me, “Remember the other day when you asked me about dyslexia? Well in fact when I was little, someone mentioned this to my parents, who brushed it off.” He appeared wide-eyed and full of fear. I looked at him and told him, “First, of all, if you really are dyslexic, you’re certainly not the only kid in the world who has this problem. Secondly, I’m no expert in the field, so it’s important for us to get you to the “right someone” who can check for this problem, then do what’s necessary to help you.” Still fearful, he asked if I really thought someone could help him. “I’m positive!” I told him with a gleaming smile, “and you know what? I plan to be with you every step of the way to make sure that things are done right!” He looked at me with uncertainty, but I maintained the smile on my face and ended by saying, “You know, this has NOTHING to do with being “dumb” and I personally believe that you’re pretty smart and have a great future ahead of you if we can nip this thing in the bud”. Toward the end of the school year, he had gone through various tests and spoken to all kinds of specialists who determined that he was indeed dyslexic. They organized the regimen required to “treat the problem.” I made sure that I kept my promise to him and followed-up on everything that was being done. In faltering writing, with several letter-reversed spelling mistakes, I received a hand-written card from him thanking me for helping him, telling me that he was hopeful that he was on the road to “recovery”. It was the most special and memorable gift that any student could have given to me. 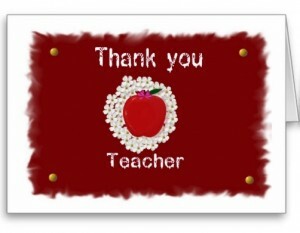 So next time you’re at a loss for what to give that “special teacher”. Besides offering the proverbial “shiny red apple”, have your child write a sincere word of thanks, explaining what made that teacher different from all the rest. For it is the greatest of gifts to know that you have contributed to someone’s life in a unique and positive way.